Female commercial driver Meanwhile, ride hailing app and tech company, Uber, is making sure that this happens sooner rather than later. First it has flagged off strategic partnership plans that will ensure by 2020, over one million female drivers will be behind the wheel globally on the Uber platform. Uber said that bringing on one million women globally to the platform was part of its global vision to economically empower women across the world by 2020. Women talking touch Already, the women are talking tough. A few of them who are already on the Uber platform in Nigeria are getting more confident and independent minded. 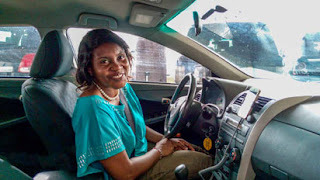 At a recent meeting between Uber and its female driver partners in Lagos recently, tagged “Uber for Her”, a female Uber driver partner, Blessing Manuel Smallvoice, while facilitating a session on Winning The Customer Service Game, said: “Women can achieve anything they set their minds to achieve. They should never look down on themselves because of their gender. Partnering with a global brand like Uber helps me to understand how to build my own business better and ensure that I always provide my passengers with an excellent customer experience.” Uber For Her, was held in conjunction with She Leads Africa (SLA), an organization run by African women for African women and dedicated to supporting entrepreneurs and their journey towards professional success through online content and offline programs. Women participants at the event, confessed to having been exposed to a myriad of opportunities available for women within the Uber ecosystem. Women empowerment Giving reasons why Uber for her is necessary, Head of Policy West Africa for Uber, Jackie Omotalade, said: “Uber is committed to promoting diversity and inclusiveness for the amazing women of West Africa. This event is an opportunity for us to continue to empower women and to show them the many ways they can thrive economically and be successful as individuals. If we plan to further develop the African continent, then it is imperative that we seriously focus on the task of upskilling our Nigerian women.” Uber global vision General Manager Uber West Africa, Lola Kassim, also said: ”We have a global vision of upskilling and economically empowering 1 million women across the world by 2020. The Uber For Her event had sessions facilitated by female Uber driver-partners, customer service and finance experts, and Tayo Oyegunle; Operations Manager, Uber Nigeria. In a related development, Uber recently rolled out a number of powerful features that have made it even easier for its over 267, 000 riders and 7,000 driver-partners to choose when, where, and how they drive. Tech savvy drivers Uber revealed that creating economic opportunities for driver-partners through technology remains one of its key priorities for West Africa for the rest of 2017, and in the forthcoming year. Kassim also disclosed; “Uber’s business partnership approach provides an accessible means for driver-partners to not only supplement their own income, but also to become small business owners, thereby helping to improve the lives and futures of individuals, families and communities. “In Nigeria, Uber has 267, 000 riders who actively use the app, and 7,000 driver-partners. In Ghana, there are 140,000 active riders and 3000 drivers signed up to use the App. The steadily growing number of Uber driver-partners in countries across the region is because of the appeal of the model; it creates real opportunities for local entrepreneurs. As demand for rides grow so does the demand for driver-partners.” Explaining further, Kassim said: “With technology at its core, Uber also invests heavily in supporting its driver-partners in their businesses through ongoing innovation as well as physical presences in the form of support centres known as the Greenlight Hubs. Apart from the existing Greenlight Hubs across Sub Saharan Africa, five more of these state-of-the-art Hubs were opened in Lagos, Kumasi, Dar Es Salaam, Nairobi and Kampala, this year.” In addition to offering driver-partners technical and app support, they also offer information sessions and tailored workshops to driver-partners, focusing on training and skills development.